Tinuy-an Falls is a three tier cascading waterfall (with a fourth tier hidden from view). 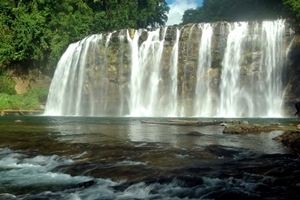 It is Bislig's number one tourist attraction and one of the main attractions in the entire region of Surigao Del Sur. Its magnificent cascades are found in Burboanan, about a one hour ride from Mangagoy, the center of trade and commerce in Bislig City. The falls themselves are around fifty five meters high and have a breathtaking width of 95 meters. Often called the Niagara Falls of the Philippines, it is said to be the widest falls in the country. Centuries old amazing giant trees, ferns and vines, in a thick rain forest, envelop your ride through heavily forested hills that enclose the falls. There are three small islets in the swimming ground area, with slippery logs where you can cross for a good view, plus multi-layered stones as pathways. Every morning, the area is blessed with a sprinkle of a rainbow that appears between 9 a.m. to 11 a.m.
Its majestic natural formation, and its picture perfect beauty, is one of a kind and truly one of the most beautiful waterfalls in the entire Philippines. The centuries old amazing giant trees, ferns and vines that surround it give a spectacular view of a beautiful natural creation. Tinuy-an Falls is a must visit destination for every outdoor enthusiasts who loves to see the beauty of nature in its natural magnificence. There is no need for trekking at the end of the road, in going, lies the magnificent beauty of the Tinuy-an Falls. 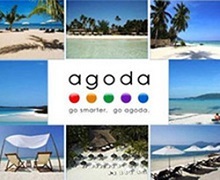 Its colorful picture once appeared in the International Travel Magazine. For more pictures and updates of the gorgeous Tinuy-an Falls, kindly visit the Tinuy-an Falls' Facebook page. EXPLORE THIS BEAUTY! There is a lot more to see than initially meets the eye. Location: Burboanan, Bislig City, 18 kilometers from Poblacion-San Isidro-Burbuanan-Tinuy-an Route and a 30 minutes ride.